So, the comeback. The weather dawns a touch on the chilly side for it. Well, -3 to be precise. 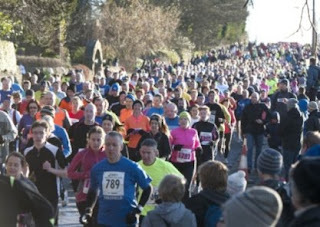 At least that’s what it was on the drive up to Sheffield for the charmingly named (if you’re drunk) Percy Pud 10k. At least it’s sunny, very sunny, so it doesn’t feel that cold. First problem is getting there, the directions are vague and Sheffield seems to have A61s, the road we have to follow, going off in all directions. After a complete lap of the ring road we decide we’re on the wrong A61. The second problem, when we find the right road, is parking, basically because there isn’t any. People are parking up on the road a good mile from the start and, with only 20 minutes to go to start time, that’s tantamount to a course extension. You would have thought the police would have something to say about so much haphazard street parking but they seem to be ok with it and are directing more traffic onto already full streets. Eventually we manage to cram the car into some gap fairly close to the start, abandon the already howling dogs and leg it down to the start, which means a more vigorous than we had planned warm up. As we line up at an equally overcrowded start line with around 1700 others I tug L forward as she is way too far back. Then once we start I realise that I’m still too far back myself. There are so many people walking from the off that it takes me 5:40 for the first km. Terrible but there’s just no room. It takes almost 2k to finally get some space. It’s the 20th running of the race and this is the biggest one ever, the race appears to fill very quickly every year no matter what the limit, but I fear it’s now too big. The route itself, once I get going, is very pleasant. We run along the Loxley Valley on closed roads and across what is a more or less flat course. There’s a wonderful view as we approach and then run alongside a damn. It would have been nice to have gone all the way around but I guess that isn’t feasible or else we’d have done it, instead it’s an out and back. As we approach the turnaround point I have no idea how the returning runners are going to get past us because we’re still covering both sides of the road. In fact what they do is squash us up by driving a car down the other side of the road. Then just in case that doesn’t create enough room, they send Santa down as reinforcements. He tries to run us down in his classic car but it seemed to do the trick. As runners start coming back the other way I can see just how many people are ahead of me, a lot, including a man who may be dressed as a reindeer or perhaps it’s Scooby Doo, it’s hard to tell, his suit has seen better days. Then I reach the turn myself. Now somewhere coming towards me will be L but the sun is low and I’m squinting into it so I don’t see her. Then the finish is in sight. 48 minutes FFS. Well, 47:49 on my watch but naturally I mentally rounded it up. Even at that pedestrian pace I still feel the need to faint but there’s nowhere to do it as I queue endlessly for chip removal, Christmas pudding and t-shirt with the reviving water handed out last. L in contrast has a relative stormer. Although she was only supposed to be setting a baseline time as something to improve on. Doing 1:01 is setting a pretty high base. In short, it’s a very pleasant race over a nice route but slightly spoil by too many entrants. Afterwards I try and bend down enough to chuck a few balls for the dogs. I can’t believe I ache this much after a mere 10k. Then after coffee we head off to Daughter’s and subsequently Wetherspoons (for speed) for lunch. I have exactly the same Sunday lunch as last week at Wetherspoons in Leamington. In fact not only is it the same right down to the choice of vegetables, I’m sure they’re positioned in exactly the same place on my plate. Yes I know the menus were going to be identical but you’d think they’d allow the chefs some room for creativity. The beer, a local one from Bradfield, is excellent though, if practically bright red in colour. Then I have to abandon the girls early to head back to Derby for the dog club AGM which goes as well as can be expected. L gets the train back from Sheffield and I meet her later in... Wetherspoons... another one, this time Nottingham’s Roebuck. The beer selection in the Sheffield one was so good we had hoped the Nottingham one could replicate it in perfect detail, like with the Sunday lunch. No joy but not too shifty and we stay there all night, although L does move to wine.